The ASUS Essentio CM6730 desktop computer system has not been manufactured for several years and is no longer available for purchase. If you are looking for a new low-cost desktop system, check out the Best Desktop PCs Under $400 for a list of currently available options. ASUS may be a big name when it comes to laptops but their desktop offerings continue to be fairly uninspired. The Essentio CM6730-05 does not really distinguish itself from any other desktop priced under $500 other than it comes with slightly more memory. Just about everything else is what you would find in most of the competition. There are some small drawbacks to this system though including the limitation of just 8GB of RAM and a small power supply that limits graphics card upgrades. The ASUS Essentio CM6730-05 takes the standard route for a desktop that is priced just under $500. It comes equipped with a second-generation Intel Core i3-2100 processor. This features two cores rather than four which is common for most AMD based systems or the slightly more expensive Intel-based desktops. Performance is still more than enough for the average user although it does lag behind in some more demanding tasks such as desktop video that can really benefit from the extra cores. It does support Hyperthreading though to help boost these tasks slightly compared to older dual-core processors. 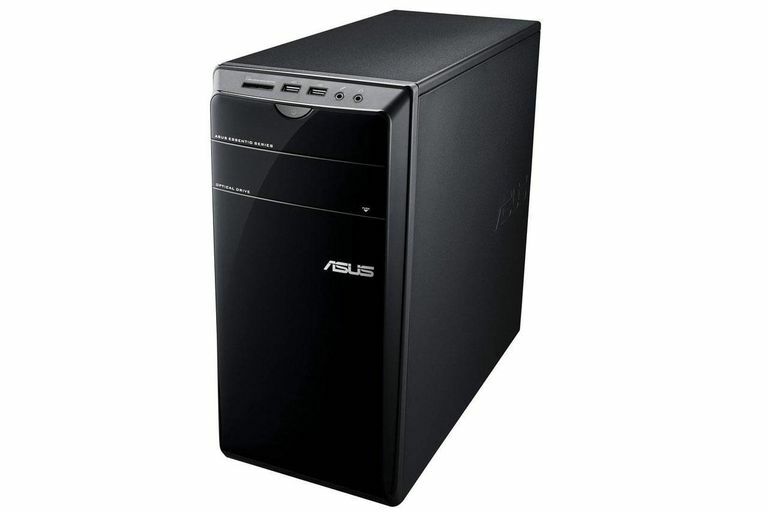 ASUS does provide the Essentio CM6730-05 with 6GB of DDR3 memory which is a step up from many low costs systems. This helps the system run smoother when dealing with multitasking or more demanding applications. There are two downsides to this setup though. First, there are only two memory module slots available. This means that the system can only be upgraded to 8GB of memory by replacing the 2GB modules with a 4GB module. Secondly, by having mismatched pairs (a 2GB and 4GB) it doesn't offer the full potential of memory performance if it were using 8GB via two 4GB modules. Storage features for the ASUS Essentio CM6730-05 are pretty much typical of what can be found in a $500 desktop system. A one terabyte hard drive provides storage for applications, data and media files. This is the average size found in many desktops. It spins at the typical 7200rpm rate that provides a bit more performance than the green series drives with their variable speeds that are becoming more common in low-cost systems. A dual layer DVD burner handles playback and recording of CD or DVD media. While some ASUS CM6730 systems offer new USB 3.0 ports, the CM6730-05 features eight USB 2.0 ports which means external high-speed storage is not available. Like most low-cost desktops, the ASUS Essentio CM6730-05 relies on the integrated graphics systems to deal with graphics. With the Intel Core i3 processor, this means it uses the Intel HD Graphics 2000 that is built directly onto the processor. This is a step up from previous Intel integrated graphics by supporting Direct X 10 but it still really lacks much in terms of 3D performance to be used for any type of PC gaming. What it does provide though is accelerated media encoding when using QuickSync compatible applications. There is a PCI-Express x16 2.0 graphics card slot for adding in a dedicated graphics card. The drawback is that the power supply within the system is only rated at a maximum of 300 watts. This means that only the most basic of graphics cards can be installed and are insufficient for any real gaming beyond a casual level.